"Recently back from our Sandals Halcyon trip and gotta say that Dream Makers Vacation Services took care of us from start to finish and even went so far as to call the resort to make sure we were having a great time!!!! " For the next few days, we (the owners of Dream Makers Vacation Services) will be staying at the Royalton Blue Waters in Jamaica. It is a fairly new mid sized resort which is about 25 minutes or so from the Montego Bay airport. 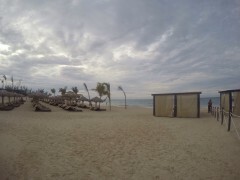 It is next to the Royalton White Sands, so guests have exchange privileges between the two resorts. The Montego Bay airport was very hectic when our flight landed so we were so happy when LaToya met us at the end of the runway. We purchased Club Mo May arrival passes which expedited us through multiple lines, saved us a lot of time and allowed us use of their lounge/restrooms before we got on our transfer. We will not travel to Jamaica without it! The cost is quite reasonable, especially if your flight is arriving between 11-2. Dream Makers Vacation Services sends many of our valued clients through the Club Mo Bay lounges and would love to send you there as well, ask your dream agent for pricing and availability. After leaving the lounge, Glen Campbell, helped introduce us to our transfer service. He is a Team Leader as per his name tag and that title is well deserved. He is kind, helpful and really made a great impression. Off we went to our transfers, which were through AMSTAR. AMSTAR provides destination services in various Caribbean countries and does a great job with both transfers and excursions. We had private transfers for the 7 of us, our van was both clean and comfortable. Our driver was Vernon and he was engaging and informative. He offered to stop at a local supermarket as Mike wanted to purchase something, which was fun. Before we knew it, we were at at the resort. Awesome! Since our rooms are in the Diamond Club section, we were whisked off to the Diamond Club lounge for our check in. In a nutshell, Diamond Club rooms are basically Club level type rooms with some privileges such as better room view/location, ability to make dinner reservations in advance and special sections/restaurant on the beach ( among other things.) With this level, you are given two Butlers. I am not sure how involved Butler's are at this resort but we will find out over the next few days and update you. We have 2, connecting rooms. The room category is the Luxury Ocean View Diamond Club level rooms. Our rooms are lovely and look brand new, The Royalton is known for their comfortable beds and rest assured our family will sleep well tonight. We spent an hour on the very nice beach and then returned to the room to get ready for dinner. Neo, our Butler, escorted us to dinner and we enjoyed chatting with him. We ate dinner at Opa, the Mediterranean restaurant. Damon was our waiter. Small menu, including choices like calamari, Greek salad, marinated olive and cannoli. Service was pleasant and fairly prompt. Our kids were exhausted so it was a fairly quick dinner for us. Thanks for reading about our first day at this beautiful new resort. As always, please reach out to your dream agent with any questions and to reserve your next dream vacation.